It is a project of the Italian government to transform lighthouses into tourism and accommodation facilities. 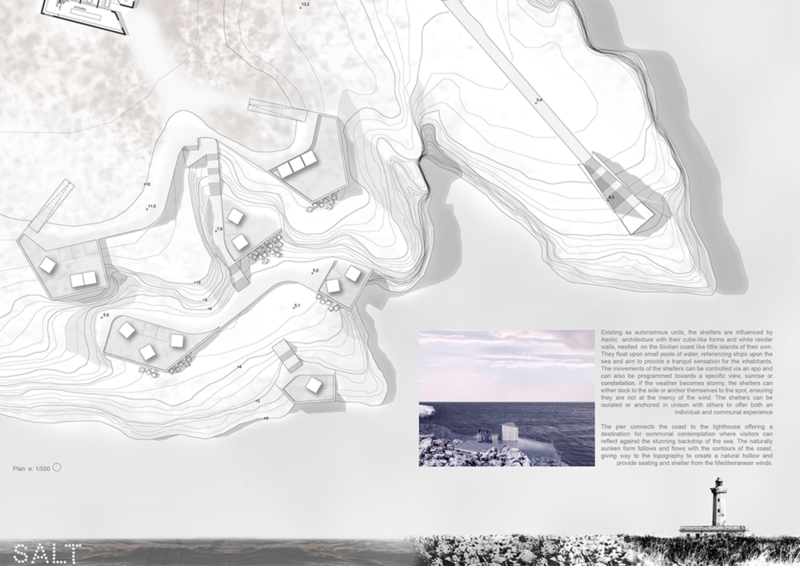 It was inspired by the idea of making the most of their valuable location and proximity to the sea to create dream-like accommodation able to reinvent the ancient lighthouses and reverse their degradation process. The lighthouse has come to represent humankind’s journey in life. It can symbolise struggle and triumph over the adversity of a stormy sea; it can warn of perils ahead in the danger of rocks and shallow waters - features perilous to journeying ships; it’s persistent light can represent spiritual strength in darkness, a guide to those in need. Ultimately, as lighthouses became automated, the rich history of the occupants who ensured safe passage for all sea-farers, gave way to the mechanisation of our technological age. In this modern era, the lighthouse has come to signify a marker, a way-finder and a beacon of hope, representing solitude, contemplation and community. The small rock pools, formed from rainwater and sea-spray, are a constant reminder of the connection between land and water. The open vessel of land upon the sea is mirrored in small pockets of water held upon the land. The interesting geological feature of tidal geysers, water blown through holes in the rocks, form an exhilarating and exciting spectacle, visually and audibly marking the ticking clock of the tide upon the rocks of Faro Murro di Porco. These features are both tranquil and explosive, static and poetic, serving to remind us of the capricious nature of the sea. The inspiration for this entry is borne from the desire for an authentic experience of both culture and local produce against the dramatic back-drop of this area of outstanding beauty. It is an architectural and cultural mark in history that allows us to look back as well as forwards. 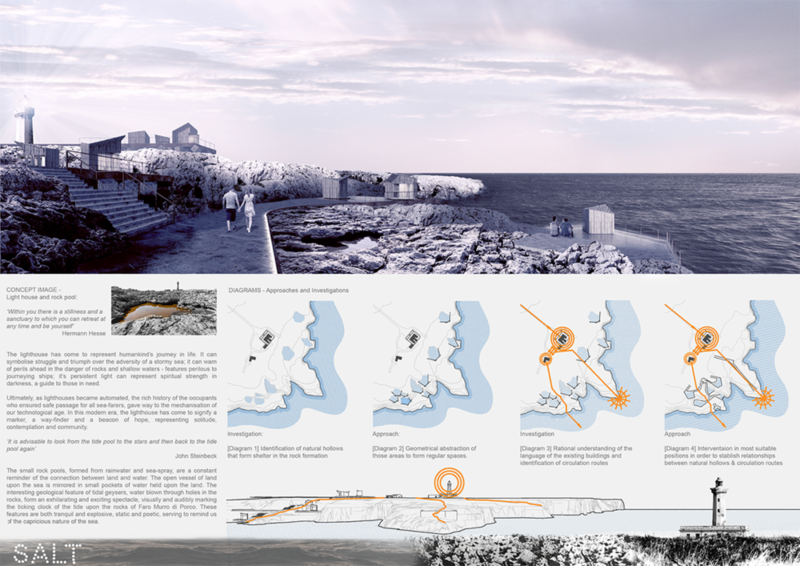 "The geographical map, in short, although static, implies a narrative idea. It is conceived in keeping with an itinerary, it is an odyssey"
Akin to the notion of Agritourismo we seek to form a proposal where people may visit the area and learn about the history of the lighthouse and the biodiversity of the surrounding land; to experience the natural beauty and solitude of the coast; to experience markets with local and seasonal produce; to participate in ‘Slow Food’ cooking in the community kitchen, dining in the restaurant, or evenings of music or theatre in the courtyard. 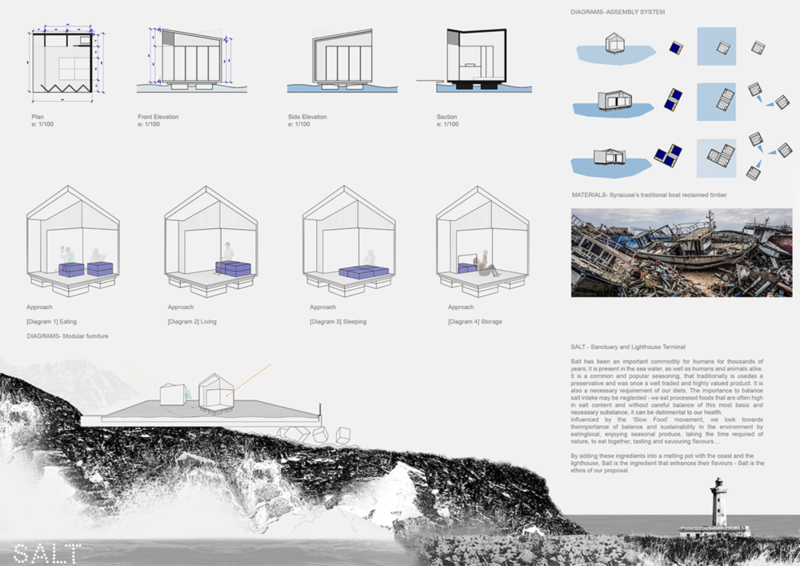 On site shelters offer space for contemplation where inhabitants can escape from the daily stress and sample coastal living. Salt has been an important commodity for humans for thousands of years; it is present in the sea water, as well as humans and animals alike. It is a common and popular seasoning, that traditionally is used as a preservative and was once a well traded and highly valued product. It is also a necessary requirement of our diets. The importance to balance salt intake may be neglected - we eat processed foods that are often high in salt content and without careful balance of this most basic and necessary substance, it can be detrimental to our health. By adding these ingredients into a melting pot with the coast and the lighthouse, Salt is the ingredient that enhances their flavours - Salt is the ethos of our proposal.